Last weekend was beautiful. It was perfect for gardening. My husband and I conscripted Daughter 1 to help clean up the summer garden beds in the backyard. Daughter 2 cared only about whether we were going to plant the seeds. She went inside when she got the news that the beds had to be cleaned up and prepared first. Deserter! Out came the eight-feet-tall okra plants. I salvaged the last of the edibles, and Daughter 1 picked a few large ones for seeds. The cuccuzza (Italian squash) vines were taken down from the fence they’d taken over. I found one small squash that will be yummy in something. 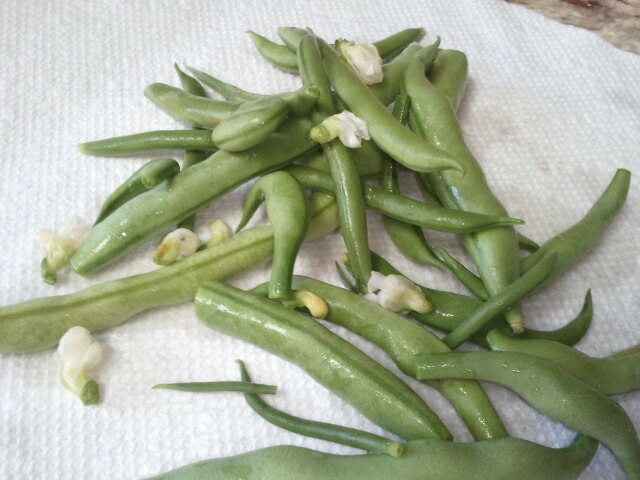 The last of the green beans yielded a small handful of beans and blossoms. The blossoms are edible and wonderful. They taste surprisingly like green beans. The ones I picked ended up on my lunch salad the next day. Yum! Before you start eating flowers, make sure the blossoms are edible. This article about edible flowers by Linda Stradley at whatscookingamerica.net explains how to choose edibles. Don’t use blossoms from a garden with pesticides. Recently, I learned that squash blooms are also edible. I wish I’d known that when we had squash growing this summer. The Seasonal Chef’s squash blossom recipes are now on my list for next summer. You can eat these without affecting a plant’s squash production. That’s not the case with green beans because the blossom is the bean eventually. I’ve grown and eaten nasturtiums. The leaves and flowers add a little something to a salad. Dandelion flowers aren’t something I’ll add to a meal, even though they are abundant in my yard (LOL). What do you think? Would you consider eating edible blossoms? Have you done so before? If so, what did you eat and how did it taste? The back garden beds are ready for planting prep. Need to turn the soil and add some compost. Work out and eat better. Food does not define me. Yep, working on this. I’m a NaNoWriMo Rebel–finish the WIP and start editing. 15-20K is the goal. Got 50 pages edited for structure and found plot holes to fill in. I’ve written only 1 K and Daughter 1 banished all fiction reading (unless I’m reading out loud to the girls) until I finish the draft. Blogging class is in full swing (WANA International). I have a list of topics to finish for homework. Still working on this.